I’m sure people were breaking down in tears, but not for that reason… geez. LINK. Rapid sea level rise is where, exactly? But who cares about reality when we have a policy to sell, right? 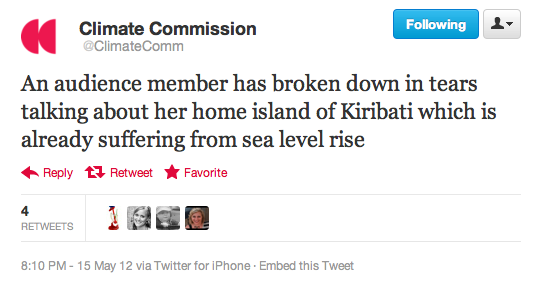 Sea level rise in Kiribati? No threat. And from the mouths of the climate commission; a deliberate deception. A lie. It used to be a crime to make false statements in public which’d cause fear/panic. Kiribati has problem with over-population especially for the available FRESH WATER; suffers chronic under-employment, pollution and is short of cheap energy, dooming the bulk of the population to a low standard of living. There is also extensive mining of corals for construction, which reduces the space available for habitation. Professor Paul Kench confirmed that there had been no loss of area as a result of (slowly) rising sea levels. The corals grow as sea levels rise. Storms, winds and waves cause coral sands to be deposited around the shorelines of the islands. The islands have actually grown in area. Kiribati is a collection of 33 atolls, barely above sea level so they will always have problems with storms and tidal surges. They also import about 6 times more than they export so are critically reliant on foreign aid and hand outs. It is in their Government three year plans to seek to secure new sources of foreign aid and support and they have identified climate change guilt as their best opportunity to do so. An audience member has broken down in tears talking about her home island of Kiribati which is already suffering from sea level rise Climate Commission over-exaggerations! Somebody better tell the Climate Commissioner’s to get their story straight with the ALPBC! Interesting, a large sea level drop at 1998 – which is also the time of the last temperature peak. Looking at the graph, the most important thing that leaps out is not any trend, but the variation. It might be trivial, but the recent fall of 250mm in a year is far more significant than any trend. Even this may pale into significance beside the normal tidal range. If it is like the Mediterranean this will be nothing to worry about, but if it is like parts of Britain where I live, high tides may swamp large parts of the islands. I recently watched a fascinating natural history program on the BBC about the pacific islands. They start as volcanos, developing quite high mountains. These are eroded over time. As they shrink, a coral ring develops. Eventually the former volcano disappears beneath the waves, leaving just the outer ring with a lagoon in the middle. That leads onto to most significant factor of all. These islands are themselves changing, and on a timescale many times more rapid than the continental land masses.